This is the penultimate board in the series and has another eroded metallic technique on that I taught at the CVC workshop last week. 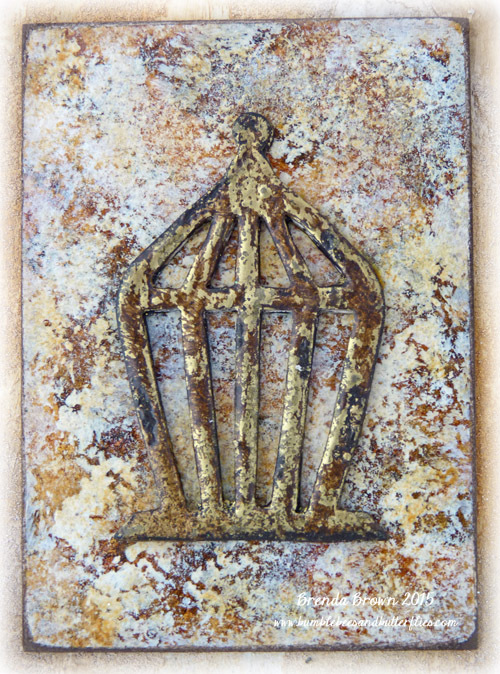 The inspiration for this one comes from Tim Holtz and his rusted enamel technique from his book Compendium of Curiosities II. I have converted it into what I call pitted brass and I also did a similar one with a silver effect too. This is the bird cage made for the shabby box that all the participants took home to make. The one here is exactly the same technique and the ATC has a faux granite effect that I have devised. 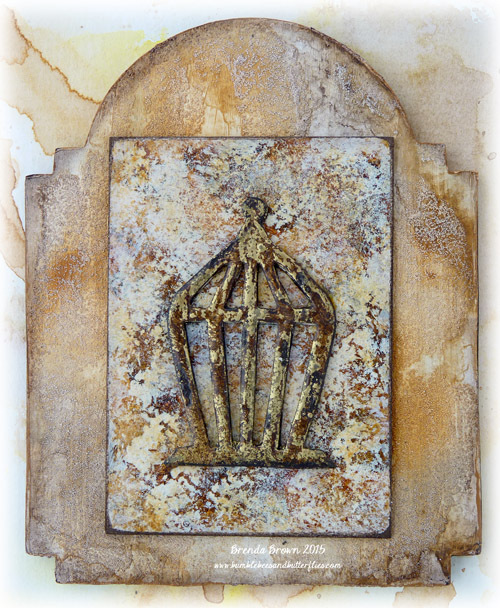 I am planning a follow up workshop using DecoArt paints and mediums for September and teaching faux paint effects like this one. The cabinet card has been texturised with my faux sandstone technique - I really have had fun creating all these new effects to use on projects. 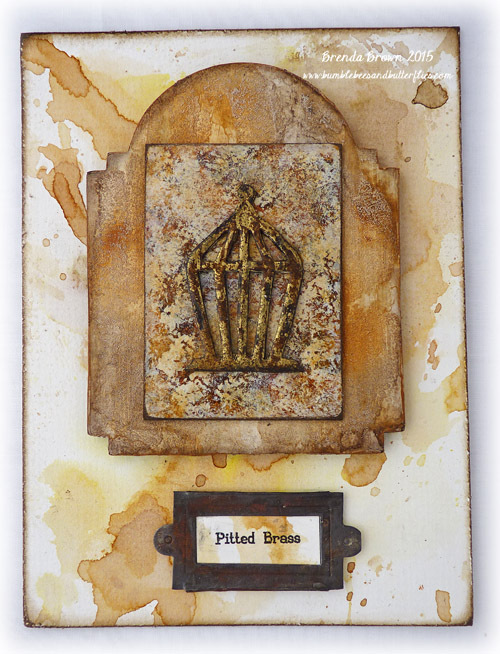 The background was dipped in vintage photo, mustard seed and gathered twigs distress inks. I hope your weekend is going well. I will show a couple of photos here and Face Book later in the week of the Isle of Wight Festival which is where I am today. Wonderful Brenda, amazing textures! Hope you are having a great time at the concert! Absolutely SUPERB backgrounds Brenda, they are amazing! 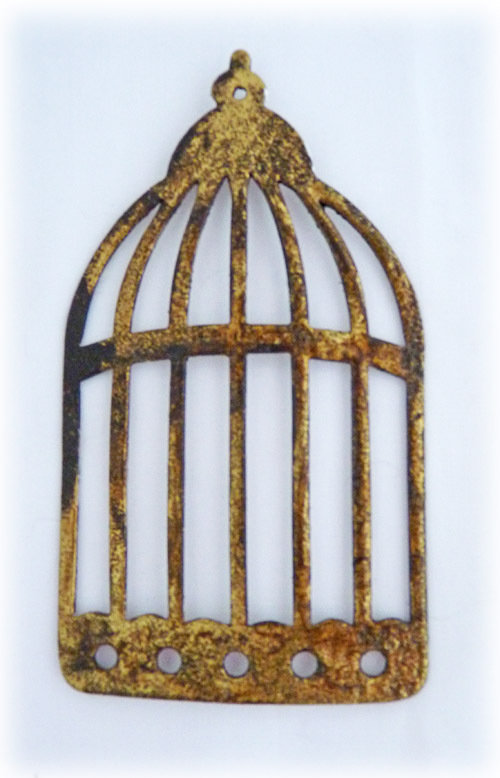 I love the pitted brass on the birdcage too, it looks fantastic... I am at a bit of a loss for words! Brilliant work! Wooow, Brenda, what a stunning piece! Love the perfectly aged backgrounds and all those fantastic techniques you've used there! Spectacular creation! Such a cool piece! Love your paint effects! Will you be offering tutorials for those of us who live across the pond(s)? Awesome work, Brenda! Love the various paint effects. Brenda you are always sharing the most fabulous projects. And today I just LOVE your techniques. Gosh what a fantastic result !!! Impressing how genuine these metal cages look. Thank you for sharing inspiration. This is LOVELY Brenda. WONDERFUL brass techniques and love how the colors of all the layers blend so well. Thanks bunches for sharing. j. Awesome piece Brenda, love the techniques you used. 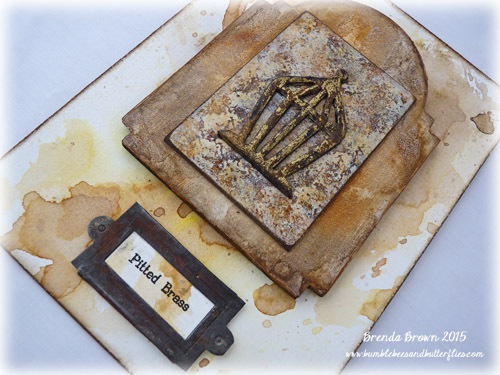 This looks fabulously vintage Brenda - wish I were near you to take some of your workshops.